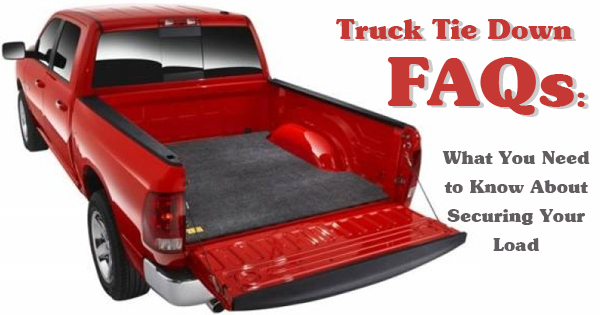 If you plan on transporting any kind of cargo in your pickup, safety is essential. But the reality is that not every driver takes the proper precautions to secure their load with truck bed anchors. They may not really understand the possible dangers that unsecured loads can cause or whether truck bed tie downs are actually necessary in all situations. We’re answering some important questions related to this topic in today’s post. What is an unsecured load versus a secured load? As you might have guessed, an unsecured load refers to cargo that has not been attached or in any way fastened to a vehicle using rope, tarps, netting, chains, or truck bed tie downs. This means that no steps have been taken (or the proper steps have not been completed) to keep cargo from detaching, becoming loose, or flying out of the vehicle while it’s in movement. A secured load, therefore, is cargo that will not be able to shift, slide, fall, or become airborne. Do I really need to secure my cargo with truck bed tie downs? In a word: yes. Even if you’re driving only a short distance or don’t anticipate a problem with your cargo, you should make it a rule to always secure it property. Keep in mind that two-thirds of the 200,000 crashes examined in a four-year study conducted by AAA actually resulted from improperly secured truck cargo. If your load shifts and falls, you could be responsible for costly damages or even injuries and fatalities. Play it safe and secure during every drive. If I drive slowly, do I still need pickup truck tie downs? As mentioned above, it’s important to secure your cargo any time you drive, regardless of how fast you’re going. It’s actually required by law whenever you drive on a publicly maintained road. Just because you’re driving slowly doesn’t mean an accident can’t occur. It’s best not to take a chance. Really heavy loads don’t need to be secured with pickup bed tie downs, right? Wrong. If you’re thinking that the load is so heavy it couldn’t possibly fall or shift, you might want to change your thought process. Heavy, unsecured items fall off of vehicles all the time — and when they do, they can cause pure chaos for other motorists. Rather than banking on the weight of your cargo to keep it all secure, why not take the time to use your truck bed tie downs and have the peace of mind in knowing it’s not going anywhere? How can I assess whether my load is actually secured? Good question. When you secure your load, you’ll want to place lighter items lower and heavier items on top. That may sound counter-intuitive, but this ensures everything is kept in place and that you can secure the heavier items to your vehicle itself. Make sure not to overload your vehicle. When you’re finished, cover it with a tarp and secure the tarp to your vehicle, too. Once you’ve done this, ask yourself whether there’s any way for cargo to become dislodged and fall or what could occur if you were to get into an accident or hit a large bump in the road. Would you feel safe driving behind this vehicle in traffic? If you feel confident in your answers and in the safety of your cargo, you’re probably using the proper tools and methods to secure it. To learn more about how our truck tie downs can truly secure your cargo every time you make a trip, please contact us today.